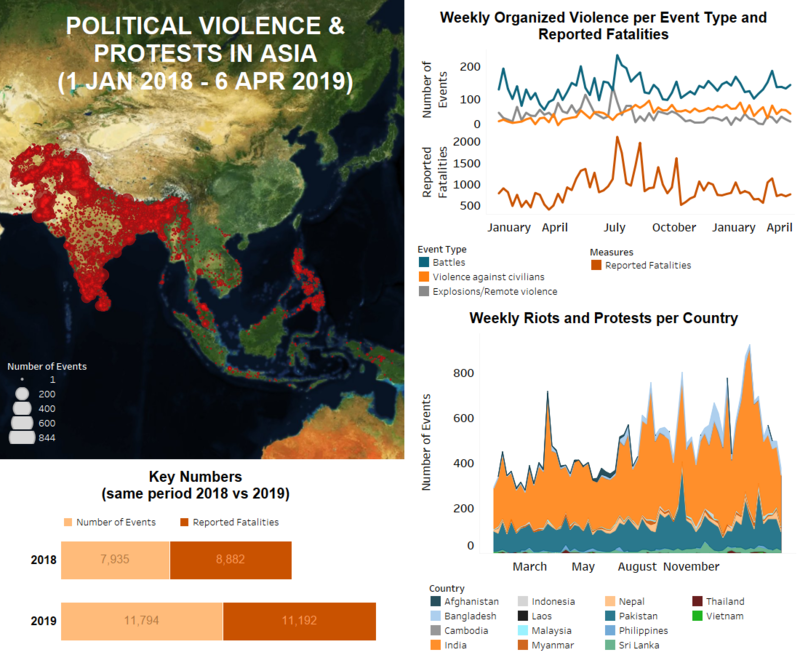 Last week, levels of organized violence remained static while demonstration events continued to decrease across the South and Southeast Asian regions. In South Asia, while Indian voters are getting ready for the general elections starting on 11 April, attacks on political activists and clashes with armed groups have been reported from across the country. In Southeast Asia, amid fighting between the military and Arakan Army, at least six Rohingya civilians were killed in aerial strikes by the Myanmar military while clashes between the Philippine military and Abu Sayyaf Group resulted in 12 reported fatalities over the course of the week. In Afghanistan last week, fighting continued between multiple armed groups and Afghan/NATO forces throughout the country. The heaviest concentration of clashes occurred in the provinces of Ghazni, Helmand, Urozgan, and Badghis. In the latter, large-scale Taliban assaults within Murghab district targeted the district centre and surrounding areas. Afghan state forces were able to hold the area after a series of counter-operations. Nearby, Ab Kamari district was also the site of a similar Taliban assault. On 5 April, Taliban fighters managed to briefly gain control of the district centre before they were repulsed by Afghan reinforcements the following day (Xinhua, 7 April 2019). Continued Taliban focus on Badghis over recent weeks hints at the possible beginning of the group’s yearly spring offensive, although nothing official has been announced; earlier in March 2019, around 150 Afghan soldiers were captured by Taliban during heavy fighting in Murghab and across the Turkmen border (NY Times, 17 March 2019). Meanwhile, the Afghan government has announced the creation of a council of political leaders tasked with appointing negotiators and creating a mandate for future peace talks with the Taliban. Thus far, negotiations between US and Taliban representatives have been ongoing in Qatar, but have excluded Afghan state negotiators – who the Taliban regard as illegitimate. The latest round concluded in early March with a possible draft agreement that would see the withdrawal of American troops in exchange for assurances that insurgent groups like Al Qaeda would not be allowed to stage attacks from Afghanistan. However, talks between the Taliban and Afghan state are necessary for lasting peace and establishing a new role for the insurgent group in post-war Afghanistan. An informal meeting between the newly-created state delegation and Taliban negotiators is tentatively set for mid-April and is meant to establish trust, with state representatives attending in a personal capacity (NY Times, 7 April 2019). In Pakistan, security forces claimed to have arrested two suspected facilitators of the Islamic State during a raid in Punjab province after a shootout. In Balochistan province, Levies forces rescued nine Afghan immigrants after a gun battle with members of an armed group. Armed men also launched several attacks on civilians, including an attack inside a prayer room (hujra) of a mosque in Balochistan, reportedly killing two people. Meanwhile in Sindh province, a Pakistan Peoples Party (PPP) leader was injured in an armed attack. In other developments, in Punjab province, National Accountability Bureau (NAB) officials conducted a raid at the residence of Pakistan Muslim League-Nawaz (PML-N) president and the National Assembly Opposition leader Shehbaz Sharif, to arrest his son and Punjab Assembly Opposition Leader Hamza Shehbaz on alleged money laundering charges. The arrest was, however, thwarted by Shehbaz’s private security guards and PML-N supporters (Dawn, 5 April 2019). In the contested Kashmir region, heavy cross-border shelling and small arms fire between Indian and Pakistani forces was reported along the Line of Control (LoC) last week. Cross-border violence led to the reported death of two Indian civilians, a Pakistani civilian, three Pakistani soldiers, and an Indian Border Security Force officer. In India, tensions remained high in the state of Jammu & Kashmir with six militants reportedly killed during Cordon and Search Operations (CASO) in Pulwama and Shopian districts last week. In addition, suspected militants allegedly shot dead a local arbiter and an off-duty soldier in separate attacks at their homes in Kulgam and Baramulla districts, respectively. Security forces also remained on high alert in areas affected by left-wing extremism and continued to conduct anti-Naxal operations in the lead up to the general elections, which will start on April 11. Last week, five security forces were reportedly killed in armed clashes with Maoist rebels in Chhattisgarh’s Kanker and Dhamatari district. Another armed clash was recorded from Jharkhand’s West Singhbhum while one civilian was reportedly killed when a pressure landmine, suspected to have been planted by Maoist rebels, exploded in Telangana’s Kamma district. Another civilian reportedly died in an explosion in Kerala’s Kannur district. It is unclear who planted the bomb. Pre-election demonstrations and violence were recorded from across the country with several incidents of targeted attacks on members of various political parties being reported from Arunachal Pradesh, Haryana, Jammu & Kashmir, Punjab, Sikkim, Tamil Nadu and West Bengal. In Arunachal Pradesh, suspected militants shot dead a former Zila Parishad (District Council) member and Bharatiya Janata Party (BJP) supporter. Meanwhile, the Income Tax Department raids in residences and offices of political leaders continued in the region, which sparked protests among Telugu Desam Party (TDP) members in Andhra Pradesh. 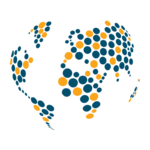 In Bangladesh, incidents of post-election violence following the upazila (sub-district) chairman elections continued to be reported from across the country, leaving reportedly two people dead. In Noakhali district, supporters of a local Awami League (AL) candidate gang raped a woman for voting for another candidate. In other developments, jute mill workers took to the streets in a countrywide protest movement demanding the payment of pending arrears and the regularisation of their services among other demands for improved work benefits. In Nepal, several groups took to the streets to protest in favour of their various demands including the release of arrested cadres of the recently outlawed Netra Bikram Chand-led Communist Party of Nepal (CPN). The government’s decision to crackdown on the party came after the outfit was involved in criminal activities, including bombings and extortion drives. Several incidents of mob violence and violent demonstrations were reported from across the country last week. In Sri Lanka, President Maithripala Sirisena pushed forward his government’s anti-drug agenda and affirmed the death penalty for convicted drug traffickers who carry out large scale drug smuggling operations while in detention (Daily News, 1 April 2019). Supporting the President’s efforts to curb drug trade, religious leaders also launched protest movements against illicit drugs in different areas of the island nation. There were at least seven protests across Myanmar last week. Three protests calling for amendments to the 2008 military-drafted constitution were held in Kachin state as well as Bago and Tanintharyi regions. Farmers in Mandalay and Magway regions called for the return of their land which had been confiscated. In Shan state, several hundred people protested against the Tigyit coal mine, calling for it to be closed. Dissatisfaction over the environmental damage and displacement caused by the mine has led to demonstrations in the past (Myanmar Times, 12 September 2018). Ongoing fighting between the Myanmar military and the Arakan Army (AA) occurred in Buthidaung and Kyauktaw townships in Rakhine state. Notably, an aerial attack by the military led to the death of at least six Rohingya who the military claimed were working with the AA. This claim was disputed with many noting those killed were just civilians (The Irrawaddy, 4 April 2019). In Kachin state, the Kachin Independence Organization/Kachin Independence Army (KIO/KIA) and Myanmar military clashed once. In Thailand, suspected separatists reportedly shot and killed two border patrol police as they prayed in a mosque in Yala. A protest was held in Bangkok on 31 March calling for election commission members to be dismissed. Subsequently, a protester who had joined the demonstration was attacked by two unidentified assailants. Many have singled out the election commission for its perceived manipulation of the election as the results of the election remain unclear (Reuters, 7 April 2019). There were seven reported fatalities from police drug raids in the Philippines last week. Battles between the Philippine military and the Abu Sayyaf Group continued in Sulu, resulting in 12 total fatalities over the course of the week. Clashes with Abu Sayyaf Group have been on the rise in recent months. A member of the Jemaah Ansharut Daulah (JAD) was reportedly killed after engaging with the Indonesian police in West Java in Indonesia. As Indonesia prepares for general elections on 17 April (BBC, 9 April 2019), JAD remains active (The Straits Times, 22 October 2018). Nearly 700 people from across Kampong Speu province in Cambodia gathered in Phnom Penh to demonstrate against their 2010 eviction by three sugar companies. Forced evictions remain a common source of grievance and protest in Cambodia (for more on this, see this ACLED analysis piece). Forced eviction was also an issue in Malaysia as many marched in the Cameron Highlands district against the Pahang government’s eviction of farmers from their land. Pakatan Harapan (PH) and Democratic Action Party (DAP) representatives joined the protest. No political violence or protest events were recorded for Vietnam or Laos.